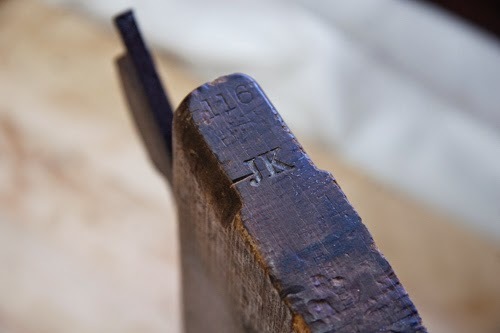 I've been wanting to figure out a way to stamp my name or initials into my tools lately. This is for two reasons: 1. So that my tools are marked when I take them to do demonstrations 2. Posterity will know these tools were mine. 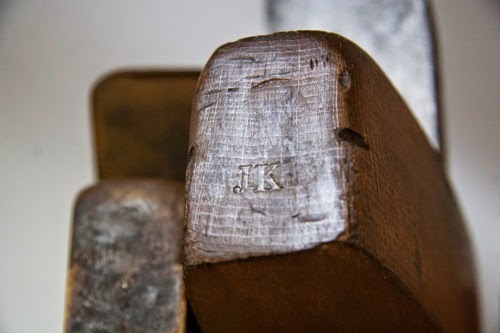 I like stamping my initials next to the previous owners'. It makes me feel part of the life of this tool. In the organ restoration trade, it is common for restorers to sign and date the organs they work on. I kind of like this. It shows us where the piece was, what was done, etc. It adds to the piece's story. So it is with my tools. As the current custodian, I am part of the chain of craftsman who used the tool before me. It's even more meaningful knowing that I will be passing these tools down to the next generation. So here's my easy solution. 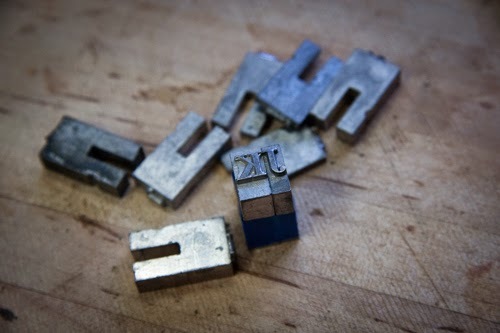 Last time I was at the Tool Barn, I took the time to dig through the box of lead printing press letters. 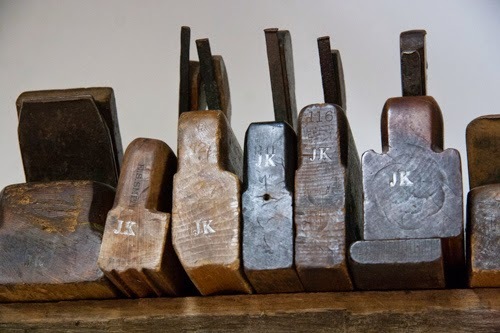 I found all the letters for "J. KLEIN". I was warned that this lead was soft and probably wouldn't hold up to stamping into wood. At .30 a piece, I decided to take a chance. I am very pleased with the results. I stamped a bunch of my tools (twenty or so) and the letters don't seem bothered at all. I am not sure how many hits they will take but I am only stamping my own tools. I won't be using them everyday. Anyway, if you have run across these in second hand shops, go for it. It works. This is a good idea, I wonder if the metal used in typewriter strikers might work too, though you'd get upper/lowercase in one strike. I'll be on the lookout to experiment myself. Now that's an interesting idea! I wanna see if that works for you. That'd be cool!